Strapped for cash after the 2008 financial crisis, local governments are bilking the poor through elaborate schemes of “offender-financed criminal justice services,” according to a new report by the Institute of Policy Studies. These increases also aligned with the privatization of probation services in operating jails and prisons. The report, for the first time brings, together disparate news stories and studies that illustrate the broad movement underway that involves criminalizing poor people and trapping them in the criminal justice system for such errant behavior as truancy, not paying parking fines or sleeping on a park bench. “…If a person is not able to afford the full amount of the fine or debt, they are permitted to make monthly installments. But on top of this, they often face additional fees linked to privatized probation services,” said the report. These costs could include payment for a public defender, room and board during lock up, probation and parole supervision, and even the cost of an electronic monitor. “When they are unable to pay, they are often placed in jail or prison with additional fines levied. It is an endless and vicious cycle targeting an already victimized sector of the population,” the report adds. The report said the NPR investigation found that in 1991, 25 percent of inmates reported owing court-imposed costs, restitution fines and fees. By 2004, that number increased to 66 percent. Currently it is estimated that 80 to 85 percent of inmates leave prison with this kind of debt. “Even after their debt is paid, these can people face discrimination in employment, housing, and social services because of the jail time they racked up when they were unable to pay,” said Dolan. 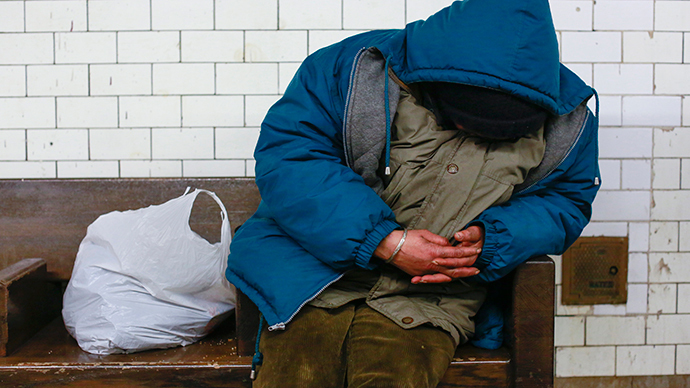 According to another report from New York's Coalition for the Homeless released on Tuesday, 60,000 people are sleeping in city shelters every night – almost double the amount since 2004. About 25,000 are children and one-third of those families are in the shelter system following evictions from their homes. The report comes on the heels of a Justice Department investigation into Ferguson, Missouri, police and court system, which found a pattern of structural abuse. In a city of 21,000 people, 16,000 had outstanding arrest warrants. The investigation found the city prioritized aggressive revenue collection over public safety, along with evidence of unconstitutional policing, violations of due process and racial bias against the majority black population. According to an investigation by NPR, the City of Ferguson collected $2.6 million in such fines and fees in 2013, most of them for traffic violations and other low-level offenses. It was the second-largest source of income for the city.